2010 marked the completion of a bizarre telescope composed mainly of ancient ice. One billion tons of ice. 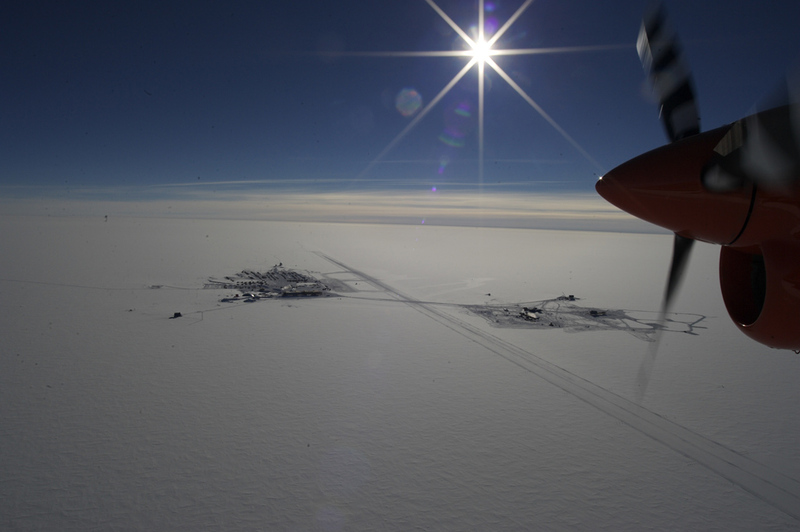 The South Pole Station and the IceCube Laboratory seen from the air. 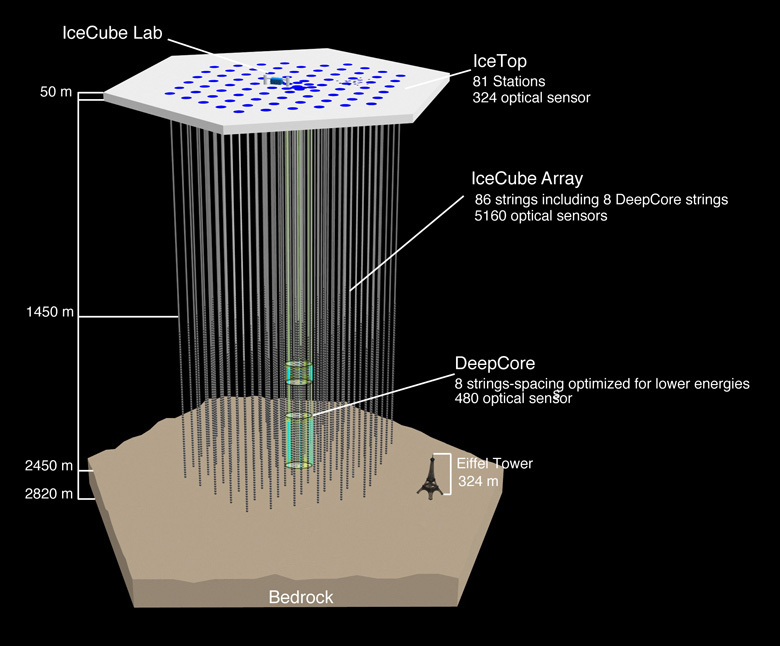 Buried a mile deep in the ice at the South Pole, IceCube is the world’s strangest telescope. Composed of water, it’s looking for the neutrino, nature’s most unusual particle. Eighty years after the neutrino was “invented” to balance a physics equation, it remains ultra-difficult to detect, measure and understand. IceCube is focused mainly on particles that come all the way through the Earth. In other words, this telescope looks down. Scientists say neutrinos can pass unscathed through a long bar of lead. How long? Say, one light year long — about 10 trillion kilometers. Because neutrinos can slip through everything in their path, including stars, galaxies and vast clouds of dust, they are unrivaled tattle-tales of ancient explosions in the deep universe. The bad news is that the same property makes neutrinos extremely difficult to see. But if you can somehow observe the neutrino’s insanely rare interaction with matter, you could learn something about the universe, and the gargantuan energy released by exploding stars. That is the promise and the premise of IceCube, a $271-million project intended to solve a problem posed in 1930, when physicist Wolfgang Pauli proposed a new and rather odd particle. Tiny, energetic, with no electric charge and not necessarily any mass, it would be virtually undetectable. 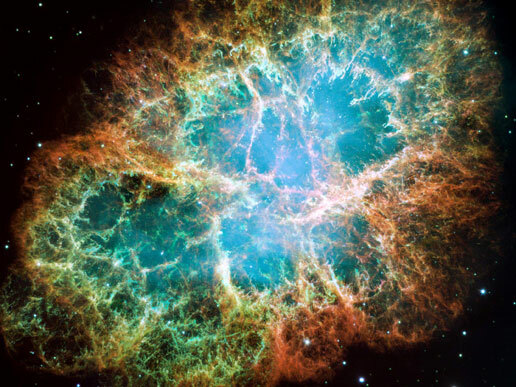 The Hubble Space Telescope snapped the Crab Nebula, a remnant of an explosion recorded by Japanese and Chinese astronomers in 1054. The super-duper firecracker, still expanding, is six light years wide. Today, scientists are sure nature is full of these shadowy characters: Rough calculations say a hundred trillion neutrinos whistle through your body every second. Why make a big deal about neutrinos, which are, after all, less offensive than campaign ads? Because that ability to pass through all manner of interstellar crud allows neutrinos to carry messages from the far reaches of the universe. Moreover, some neutrinos carry more punch than the wildest gamma ray. And just as you can’t pull a hot coal from a cold fire, you shouldn’t get “hot” neutrinos from “cool” sources like ordinary stars. These neutrinos, in other words, may deliver signals of some hip, blazingly hot stuff — neutron stars, active galactic centers, and exploding stars. Finally, according to some scenarios, lower-energy neutrinos may comprise a small proportion of the mass — the stuff — of the universe, but they played a key role in the evolution of the universe. In astronomy, as in love and antiques, “hard-to-get” translates into “most-wanted.” “The hope is that the particle that is almost nothing will tell us almost everything about the universe,” says Francis Halzen, a theoretical physicist at University of Wisconsin-Madison. Halzen directs IceCube, and did the same at IceCube’s predecessor, AMANDA, the Antarctic Muon and Neutrino Detector Array. 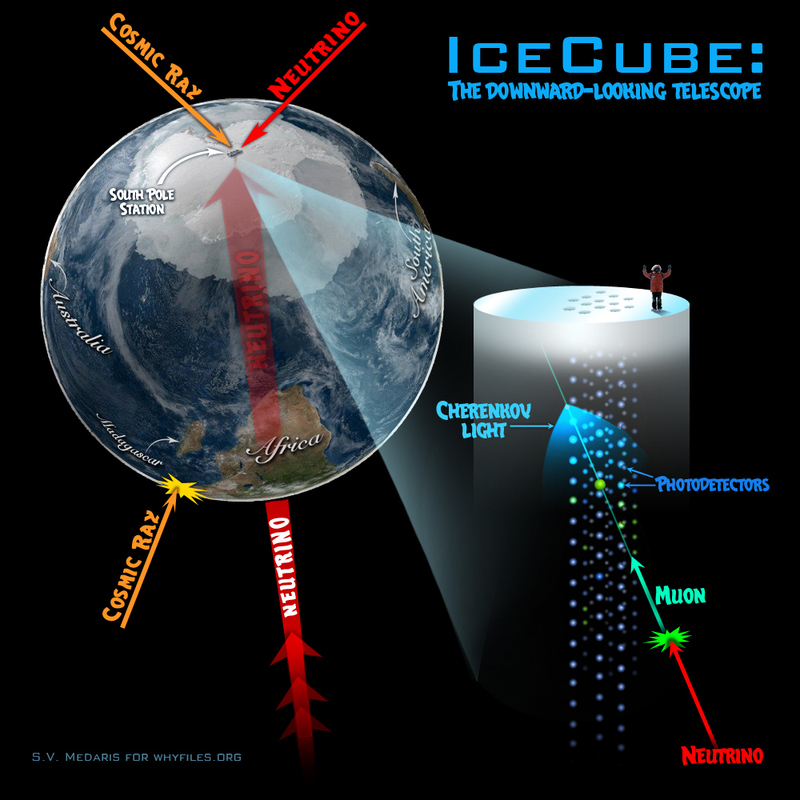 IceCube sees both cosmic rays and neutrinos from the Southern-Hemisphere sky. Earth blocks cosmic rays from the Northern Hemisphere, so IceCube sees only muons made by those mysterious, high-energy neutrinos from the north. This hot-water drill can cut more than two kilometers of ice in less than two days. Speed matters in the two-month South-Polar work season. Neutrinos may be shy, but once in a great while, they actually hit an atom and produce a subatomic particle called a muon, which is easier to see. Because the odds of a neutrino hitting anything are so dismal, physicists require bigger targets. It’s the same principle that lottery players use to “beat” the tiny odds of winning by buying hundreds of tickets. Previous neutrino targets have included tubs of oil or dry-cleaning fluid and 5,000 tons of steel plates salvaged from battleships. To block spurious signals due to cosmic rays rather than neutrinos, these detectors have been sunk in the ocean or placed inside deep mines. IceCube relies on a two-step detection sequence: First, the tiny percentage of neutrinos that interact with atomic nuclei in the ice produce muons. Second, these muons create Cherenkov light when they interact with matter. When the detectors see Cherenkov light, they digitize the data and send it through electric cables to the surface for analysis. The detectors are housed inside 5,160 crush-proof glass spheres placed in holes drilled through the ice, and located 1450 to 2450 meters deep. Another 324 detectors at the surface detect muons made by cosmic rays arriving from the Southern sky. The Antarctic ice also has little radiation, and the detectors are so deep that air bubbles have been squeezed out, ensuring great optical clarity. Yet while the detectors are shielded from damage, they are under crushing pressure, and if they go bad, they will be busted forever. IceCube will only look at muons that trigger at least eight detectors, says Halzen, and is most interested in muons moving upward — coming from the Northern Hemisphere. Downward signals can be confusing, as most of them are due to cosmic rays or lower-energy neutrinos, which Earth blocks. The IceCube Neutrino Telescope contains strings of detectors that measure the blue flash of “Cherenkov” radiation, which signals the passage of a muon generated by a neutrino. Data from IceCube should suggest where the neutrinos originated and what sort of cosmic engine started them on their journey. This desire to concentrate on neutrinos rather than cosmic rays explains why this frozen telescope, oddly but logically, looks downward. FAST. 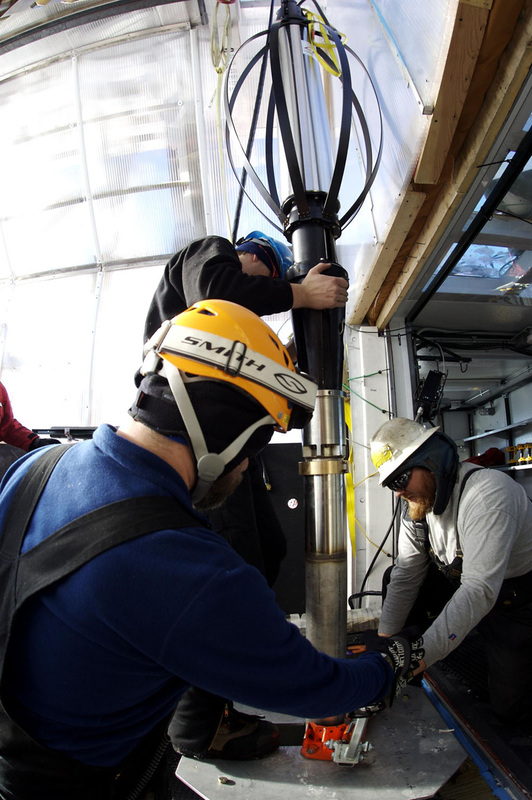 The IceCube crew could only drill two months a year, so quick drilling not only saved time and money, but really enabled the program to exist in the first place. Fast work in the immense cold also prevented the water from refreezing before the string of detectors was in position. These light detectors (shown without protective glass sphere) are the source of IceCube’s data on neutrinos. Roll over to watch a completed detector being lowered into the ice. What can these neutrinos tell us? Gamma ray burst: In a couple of dozen seconds, these gargantuan gamma-ray sources can send out as much energy as our sun will during its entire life. The bursts, billions of light years distant, may result from the collapse of a massive star, but a paper from the IceCube group will soon question whether they are major neutrino sources, says Halzen. Active galactic nucleus: This stormy region around a black hole emits huge amounts of energy but is shrouded by gas and dust. Active galactic nuclei are astonishingly bright source of microwave, infrared, visible, ultraviolet and gamma radiation, and likely neutrinos as well. 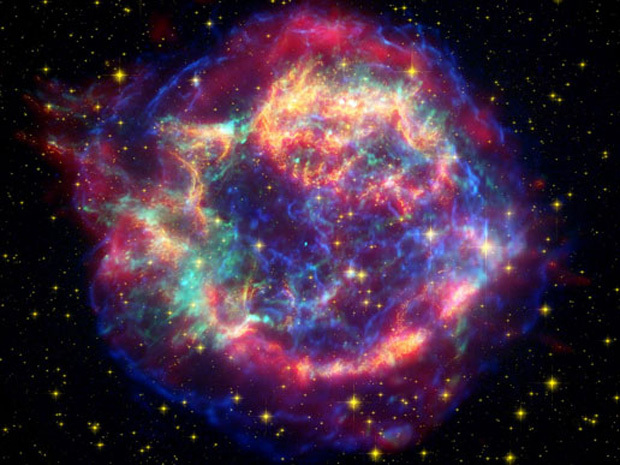 Supernova: The explosion of a dying star occurs when gravity overwhelms the outward pressure from nuclear fusion. The last nearby supernova, in 1987, energized astronomers and caused a 10-second burst of neutrinos that lent credibility to neutrino science. Neutron star: This relic of a supernova is composed of pure neutrons, which don’t repel each other. Therefore, neutron stars are rather dense: a teaspoonful probably weighs several billion tons. Neutron stars start life at about 10 11° C to 10 12° C, but quickly radiate away energy via an intense blast of neutrinos and electromagnetic radiation. Located 10,000 light-years away in the constellation Cassiopeia, Cassiopeia A is the remnant of a massive star that died in a violent supernova 325 years ago. The dead star (turquoise dot in center) became a neutron star surrounded by a shell of junk blasted away in the explosion. Image is a composite from three orbital telescopes: Infrared data from the Spitzer Space Telescope is red; Visible light from the Hubble Space Telescope is yellow; Chandra X-ray Observatory data is green and blue. Although supernova neutrinos have low energy and are hard to detect, a nearby supernova could light up IceCube enough to overwhelm the system. To prep for a supernova, Reina Maruyama, an assistant professor of physics at University of Wisconsin-Madison, is working to ensure that IceCube can handle this once-in-a-lifetime chance to get good data on a stellar explosion. 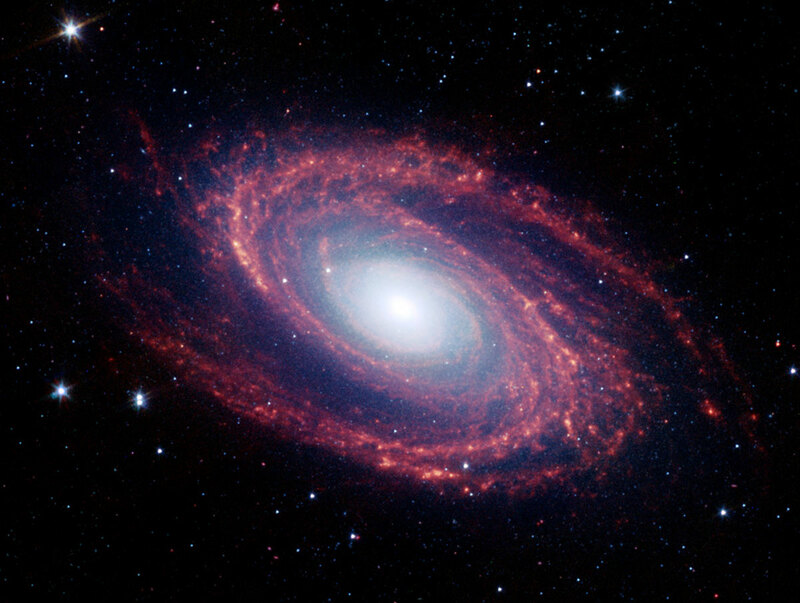 The spiral galaxy M81 is about 12 million light years away. Galaxies take millions of years to rotate, but without dark matter, centrifugal force should cause them to self-destruct. Even weirder than neutrinos, IceCube may explore dark matter, a type of, well, something, that comprises 23 percent of the overall universe. A measly 4 percent of matter, including the galaxies, stars and planets, is visible. The balance is an even stranger quantity called dark energy. The first inkling that some matter is invisible came in the 1930s, when a physicist noticed that galaxies rotate too fast: their visible mass would create too little gravity, and thus they should spin themselves into oblivion. The explanation for that increased gravity is now called dark matter, and the race is on to detect it. Since dark matter affects gravity, Maruyama says it must gather in the sun and the galaxies. When dark matter particles collide, they are expected to release a type of neutrino called muon neutrinos. But IceCube found no muon neutrinos coming from the sun and the Milky Way, using a technique that was 1,000 times more sensitive than previous ones. 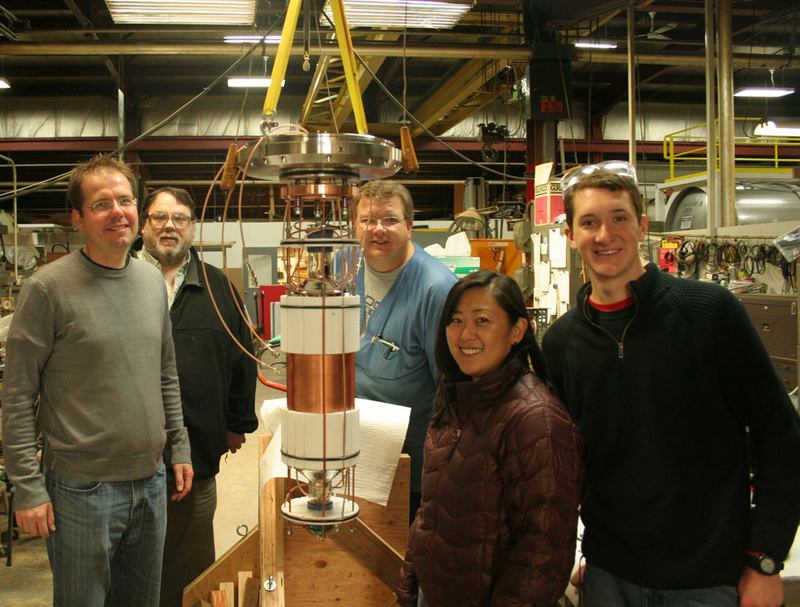 Reina Maruyama (second from right) and colleagues with a prototype dark matter detector that’s now two-plus kilometers deep in the Antarctic ice. However, an experiment in Italy may have seen dark matter interacting with a hunk of sodium iodide, based on an annual variation in the signal. If Earth indeed orbits through a cloud of dark matter, the detector would register alternating downstream and upstream motions that could account for that annual cycle. The cycle could, however, be due to something unrelated to dark matter. Ever since Galileo discovered the moons of Jupiter using a telescope similar to those built to allow traders to eyeball incoming ships, astronomers have used new instruments to find amazing stuff in the attic. Another discovery with practical roots occurred in 1965, when two Bell Labs physicists tried and failed to remove noise from a communication antenna. Before long, it became clear that they were hearing cosmic background radiation — a remnant of the Big Bang that kicked off the universe. Gamma ray bursts have been detected by instruments built to track nuclear explosions. And a series of satellite telescopes sensitive to new parts of the electromagnetic spectrum have uncovered a cosmic zoo. To answer that riddle, Maruyama wants to place a similar detector deep in the Antarctic ice, and has already piggybacked two prototypes onto IceCube strings. The prototypes are working well enough to justify a larger, more expensive detector, Maruyama says. Lurking behind the IceCube project is the tantalizing prospect of learning more about the bizarre particle it detects — the neutrino. We already know that neutrinos have a tiny amount of mass, and that they range in energy through at least 30 orders of magnitude — an unimaginable range of energies. There have been recent — and controversial — reports that neutrinos can travel faster than light — breaking a basic law of physics. Halzen anticipates spotting an extremely high-energy particle called the GZK neutrino. “These are predicted by theory, and if one hits the detector, we won’t have to do any analysis, we will be able to look at the event display and know that we have made the discovery.” GZK neutrinos are, according to theory, made by cosmic rays that strike photons in the microwave background, Halzen says, and thus could finally reveal the origin of the cosmic rays, one century after their discovery. An IceCube image shows an up going muon. Red = higher energy; blue and green = lower energy. Rollover to see multiple neutrino detection in one image. 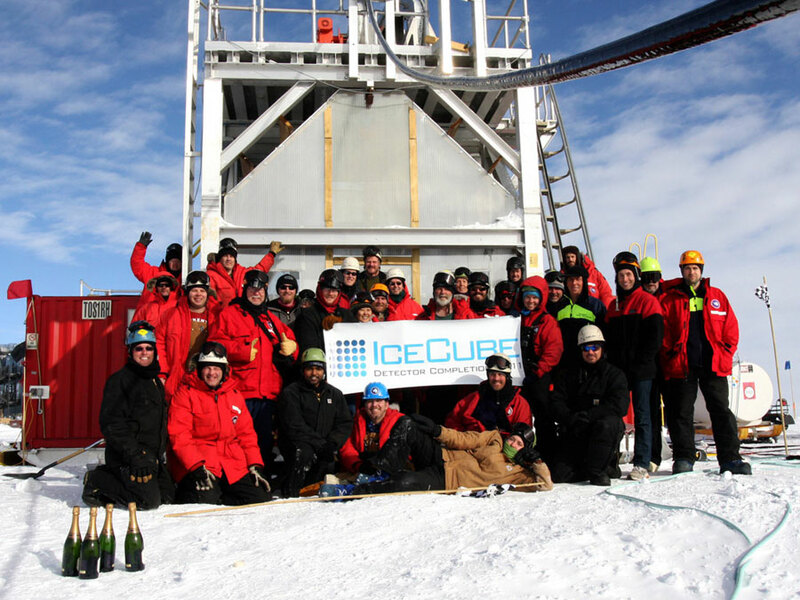 The team celebrated after the IceCube Neutrino Detector was completed in December, 2010. Drilling started in 2005.